APRIL 24, 2009… The “chassis” on which my market analysis is built is called Dow Theory. The inventor of Dow Theory, the Dow Jones Industrial Average and the first editor of the Wall Street Journal, Charles Dow, laid out his theory in a series of editorials in the Wall Street Journal over 100 years ago. These were recorded and reproduced by his understudy William Hamilton, and subsequently published in ‘The Stock Market Barometer’ in the 1920’s. Orthodox Dow Theory requires that the Dow Jones Industrial Average or DJIA (the stocks that make stuff), and the Dow Jones Transportation Average or DJTA (the stocks the ship the stuff) must act in concert to confirm the direction of the market. The best way to to visualize this is to equate the market to the tide of the ocean. Imagine two friends standing on a beach attempting to determine if the tide is going in (up) or out (down). One friend puts a stick in the sand at the point where the waves recede. The other friend does the same further down the beach. After a few minutes, the stick is completely covered in water so it is pulled out and placed at the new spot, higher up the beach, to where the waves now reach. At the same time the friend down the beach “confirms” that his stick too, had to be moved and placed higher up the beach and therefore they can safely assume that the tide is coming in (or going up). This is the essence of the confirming nature of Dow Theory. Think of the two friends as the DJIA and the DJTA. QUESTION: If it is so simple, why aren’t more people doing this? ANSWER: Because as simple as it is, it isn’t easy. Human emotion gets in the way and corrodes the un-emotional framework of the chassis. QUESTION: How would this theory have performed in the latest market crash? ANSWER: Dow Theory turned bearish or negative on 21 Nov 2007. The 103 year track record of Dow Theory beats buy and hold by 3900%. QUESTION: Why hasn’t my advisor told me about this before? ANSWER: Dow Theory has come under constant criticism because it is always late. It is the grandfather of all “trend following” disciplines, and as such, it tends to lag the market. Also the brokerage industry is focused on commissions and trading. Dow Theory made only 63 trades in 103 years – hardly enough to make the lease payments on your broker’s BMW. 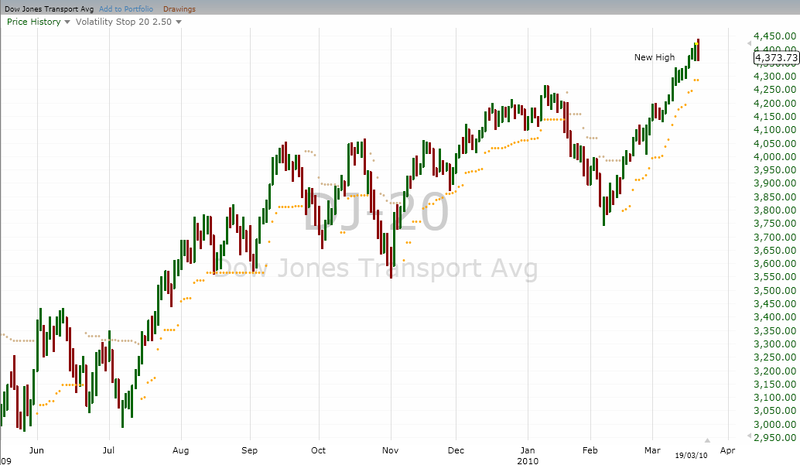 QUESTION: What does Dow Theory say now? ANSWER: Currently Dow Theory is still bearish, or negative. There is evidence that the tide may be turning, however, it is too soon to make that determination. Take a look at Chart 1 below. The light green line shows the April 17th highs in both averages (remember the sticks in the sand?). APRIL 16, 2009…. One of the criticisms of Dow Theory is that the signals always lag the market. This is true of any trend-following methodology and Dow Theory being the grand-daddy of them all is no exception. As my friend John Murphy said today, “bottoming is a process”. The beginnings of the process are evident, however, bear markets don’t end with a “V” bottom. QUESTION: What would it take to signal a new bull market? ANSWER: Traditionally, there is a re-test of the prior lows (in this case March 9th, 2009). 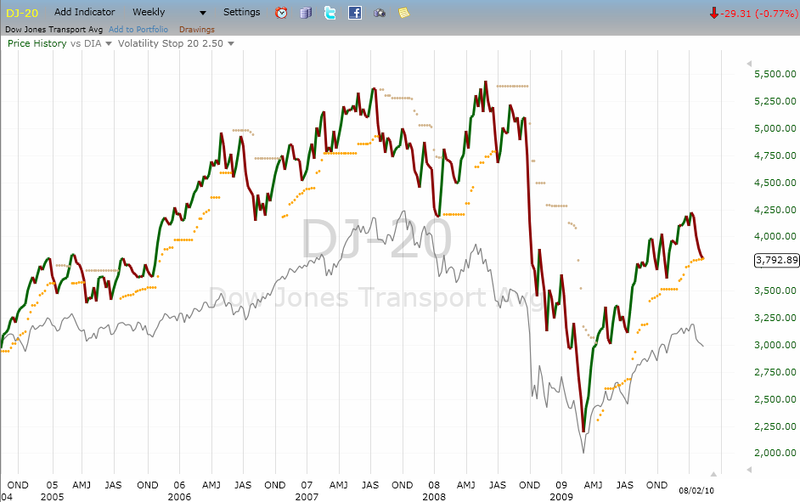 Dow Theory requires that these lows hold, and then the Dow and the Transports better their most recent April highs. QUESTION: What if no re-test occurs and the market powers higher? ANSWER: The market can and will do anything. The probability is that some sort of pull-back or re-test is coming. The momentum indicators are diverging and there are too many bulls. Imagine throwing the cap of your pen into the air — at the highest point the momentum (acceleration) has slowed to 0. I believe we are reaching that point. QUESTION: I’m tempted to buy now – the market is going up and I’m missing it. 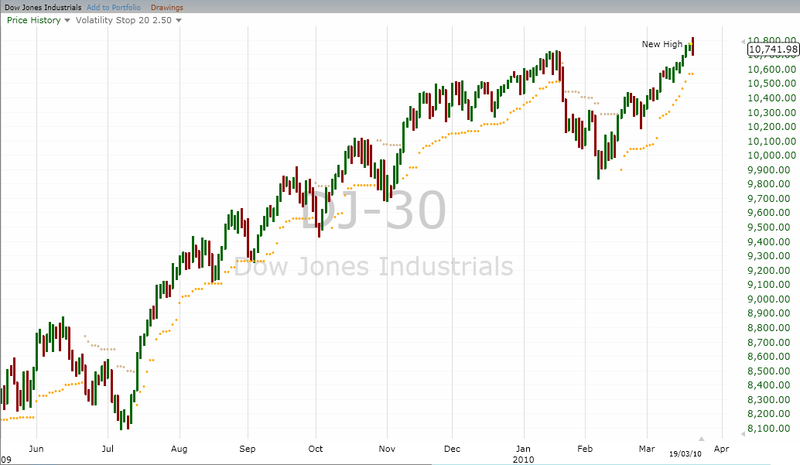 Should I buy the Dow stocks now? ANSWER: No. If you look at the probabilities using a “weight of the evidence” approach, I still favor cash. There has been no Dow Theory BUY signal yet, and the current bear market has been the shortest of the big three bears this century. The biggest financial calamity in history is not likely to end with the shortest bear market. Dow Theory is about values. At the bottom of the bear market in 1974 and again in 1982 (not shown) the market was trading at 5-7x P/E ratio or Price to Earnings. This means you paid $5-7 for each dollar of earnings. The dividend yields were 5-8%. Today’s market is no where near such a bargain. 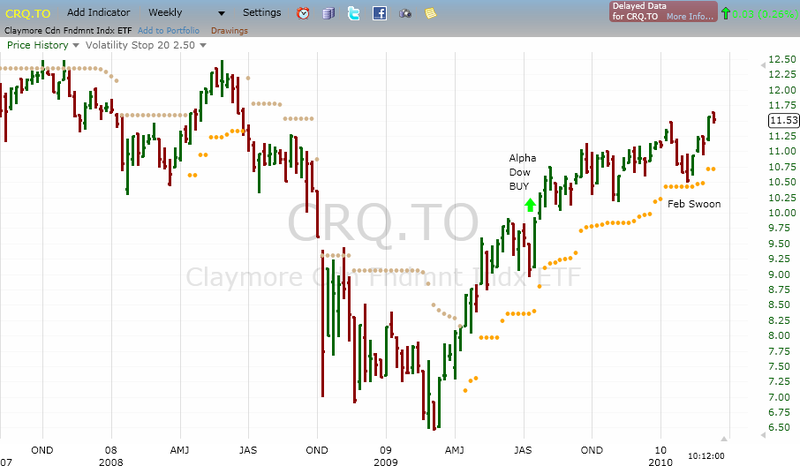 My position is that we are in what Charles Dow would call a secondary reaction — a rally within a bear market. I could be wrong, I often am, however, capital preservation is still the primary concern of my subscribers. If the facts change, I will report them here as quickly as I can.